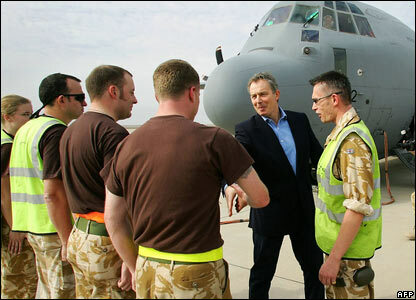 UK Prime Minister Tony Blair greets RAF personnel in Basra during a surprise trip to meet troops and hold talks on Iraq's future following last week's election. 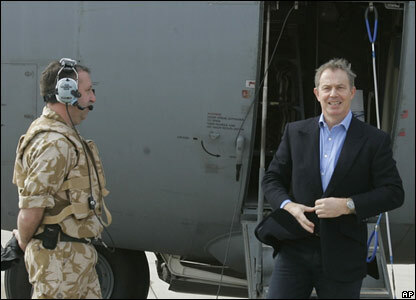 The pre-Christmas visit, Mr Blair's fourth trip to Iraq since the 2003 invasion, is intended partly to thank the 8,000 British troops who will be in Iraq over the holiday period. 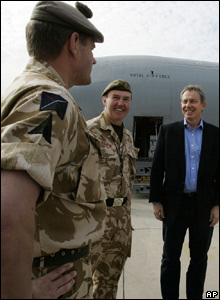 Mr Blair was greeted by Lt Gen Nick Houghton (centre), the senior military commander in Iraq. 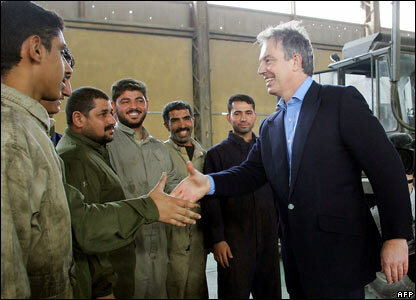 Mr Blair greets Iraqi civilian workers attached to the Royal Logistics Corps at Shaiba Logistics Base in Basra. He said the goal of a stable Iraq was worth fighting for. 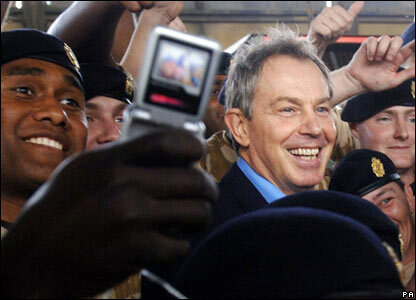 One soldier gets his mobile phone out as Mr Blair rallies the troops during his surprise pre-Christmas visit. Mr Blair meets soldiers including personnel from the Royal Irish Regiment, the Royal Regiment of Fusiliers and the 9th/12th Lancers. 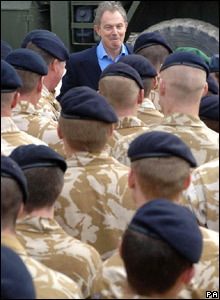 Mr Blair told soldiers they could be "very, very proud" of the work they were doing. The prime minister tells troops in Basra: "I just want you to know how grateful we are for the work you are doing here." 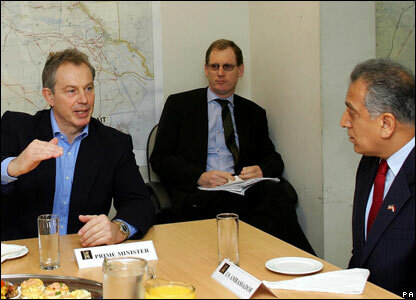 Tony Blair talks to US Ambassador to Iraq Zal Khalilzan (right). 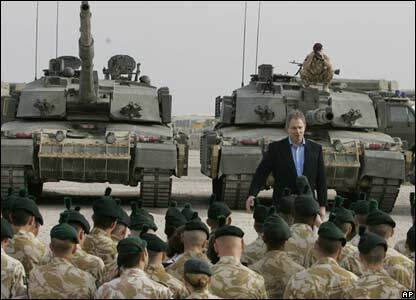 Mr Blair says he will not set an "arbitrary" timetable for withdrawing UK troops from Iraq. 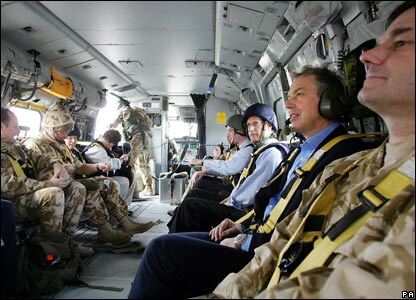 Mr Blair is transported in a Royal Air Force Merlin helicopter to Shaiba Logistics Base in Basra. 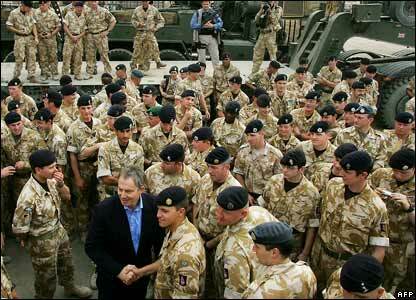 Afterwards, he addressed 4,000 troops from the back of a low-loader truck.